The draft Environmental Impact Assessment (EIA) was the government's first statement on the impact that it expected the construction of the HS2 high-speed line would have on the local environments through which it would pass. This includes everything from the disturbance of badger setts to the effect of noise and vibration on nearby buildings. From a historical point of view, the concern of the society is the likely damage to archaeological sites and historic buildings along the route, which will range from the intrusion of the line into historic landscapes to the complete destruction of listed buildings. The Draft EIA was issued ‘for public consultation’ in late May 2013. Our immediate reaction was disappointment at a deplorable lack of detail – the baseline was manifestly incomplete and seriously underestimated the effect of HS2 in all areas	– but this was particularly notable for its impact on the historic environment. Other organisations, including the County Council, shared this view. Nonetheless the society submitted a response on the effect HS2 would have on the county's Cultural Heritage. Our response supported the proposal made by the the Chilterns Conservation Board among others for a ‘Chilterns Tunnel’ running all the way from the Colne Valley to Wendover. This would avoid most of the environmental impact in the Chilterns Area of Outstanding Natural Beauty, including damage to the prehistoric Grim’s Ditch and several historic buildings. The HS2 route in the Chilterns after the 2012 changes. 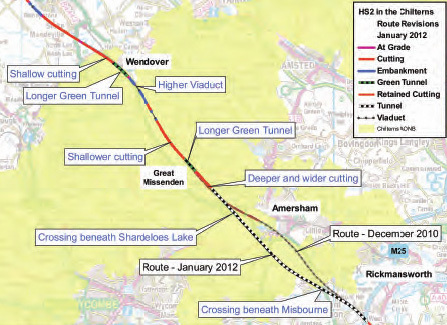 The proposal would put the whole of the line from near Great Missenden into a longer tunnel ending north of Wendover. and the historic landscapes at Twyford and Chetwode. The society received no acknowledgement of its response to this ‘Consultation’. However the draft EIA was followed by the government appointment of a professional archaeology service, Cotswold Archaeology, to review the likely effect of the construction of HS2 on the historic environment. Through several meetings with Cotswold Archaeology, the society was able to ensure that our views and the results of our surveys were taken into account. The eventual outcome of this process was the publication of the much more comprehensive HS2 Environmental Statement in late November 2013. • See the society's Response to the HS2 Environmental Statement in February 2014.